The ability to increase cardiac frequency and contractility is essentially dependent on the stimulation of cardiacβ-adrenergic receptors. These receptors are mostly of the β1-subtype, while the β2-subtype constitutes only a small fraction. Both receptors are coupled to an increase in the production of cAMP and increased opening of calcium channels. Thus, the consequences of their acute stimulation are similar. Transgenic models with heart-specific overexpression have been generated for both receptor subtypes. The characterization of these mice has shown marked differences in the respective phenotypes. Overexpression of the β2-subtype revealed very significant constitutive activity of these recaptors, as evident from an increase in basal heart rate and contractility. These effects appeared to be sustained at least for the time periods of investigation. In contrast, the overexpression of the β1-subtype resulted in only a short-lived improvement of contractility, which was only seen when the receptors were stimulated. There was very little change in basal heart rate, suggesting a low constitutive activity of this receptor subtype. From four months of age onwards, cardiac function and structure deteriorated. Histologically, there was marked myocyte hypertrophy and fibrosis; macroscopically, only minimal hypertrophy was visible. Cardiac catheterization revealed a progressive loss of contractility, which at an age of nine months was reduced by about 50%. In vivo NMR imaging also indicated a massive reduction of the ejection fraction, which was only about 20% at nine months of age, compared to about 60% in wild-type control mice. Thus, the data available so far suggest strikingly dissimilar phenotypes resulting from the heart-specific overexpression of the two β-adrenergic receptors. Further studies will have to show whether β2-adrenergic receptor transgenic mice maintain their phenotype at an older age and - if so -will have to elucidate the biochemical basis of these discrepancies. 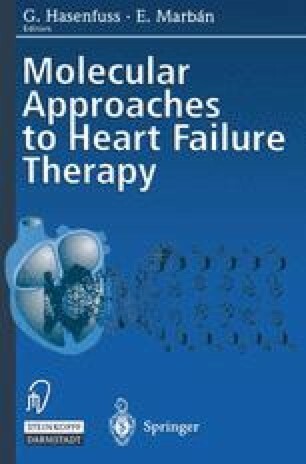 And finally, the usefulness of the β1-receptor overexpressing mice as a model for heart failure in human patients will have to be evaluated.